MagniLink S Software is compatible with Windows 7 and Windows 8 but we do not guarantee or support backward compability with Windows Vista and Windows XP. Yes, our software is compatible for use together with software from Dolphin v12.03 and forward and AiSquared v9.19 and forward, on Windows 7 and Windows 8 based computers. We also support iZoom from version 4 and forward and MagniLink iMax. 3. How do I get the latest update of the MagniLink S Software? 4. Which accessories are available? LVI offers an A3 docking station with/without X/Y-table as well as a portable X/Y-table in A4 size. Also different external control boxes, hardware splitbox and monitors adapted for MagniLink S, see separate Accessory list. Yes, the system is backwards compatible with USB2.0 standard, but it will of course limit picture quality somewhat. You will get a lower resolution output from camera and lower accuracy level when using OCR software. The system will need 2 x USB2.0 ports to power the unit, instead of one USB3.0. USB2.0 cable can be ordered separately from LVI (product code USB2.0-Y). Yes, the system is module based and can be connected to a number of other LVI products. Connect the hardware splitbox to MagniLink S Computer and split the image between the distance camera, reading camera and a monitor/computer. 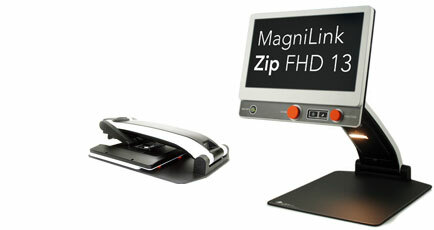 As an option, an external distance camera can be connected as well as a MagniLink S Docking station. Yes, pictures can be saved and video with sound can be recorded. This means that the user can replay a lesson or other important things. Tip; Use BlueTooth based microphone on the teacher to achieve good sound quality when recording in school. 8. Can I connect the MagniLink S to my MAC? Yes, all MagniLink S computer and computer/monitor models works on a MAC. If you need OCR/TTS-functionality (Text to Speech), you need to order the MLS-CM03-MAC (for PC: MLS-CM03). Yes, all models except MLS-C01 (MagniLink S computer SD) can be connected directly to a monitor/TV through the HDMI connector. The system is then controlled by either the integrated or an external (accessory) control panel. Yes, if you turn off the system with the off button. If you suddenly pull the cord out or if there is a power outage, the settings will not be saved. Yes, the controls can be used at the same time, this also applies to the external control panel. Yes, make sure that the computer connected (not the computer connected to MagniLink S) to the projector is set to 60Hz, to make sure that there is no interference in the camera picture of the whiteboards. Tip; There are also other ways to connect the pupil´s PC to interactive whiteboards by software, please contact the LVI support team to find out how to do. An adapter cable can be used to connect the MagniLink S to a VGA interface. Though it will cause a considerable loss in image quality. Buying a new monitor is a better solution. 15. Can a computer with USB2.0 be used for OCR functionality? Yes, if the computer follows recommended requirements (please see MagniLink S manual) it can be used for OCR/Text to speech. Best picture quality such as high frame rate and highest possible resolution will however always be best with USB3.0. 16. Can I use PCMCIA card USB3 to get USB3.0 in a USB2.0 computer in combination with MagniLink S? We don´t recommended using PCMCIA card. We have tried several computers and we can´t guarantee that it will work. Please use a computer with USB3.0 or use split cable for USB2.0 (see question 5). 17. Is OCR functionality available for MLS-C01/MLS-CM01? No, it will only be possible to use OCR functionality (TTS) with MLS-CM03/MLS-CM03-MAC (included) or MLS-CM02 (together with product code MLS-A102).